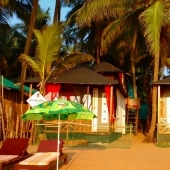 Velvet Sunset resort is at the far north side of Agonda beach Goa, in fact it is one of the last resorts on this beach, Velvet Sunset resort is relatively new, but already it has the very typical secluded/laid-back vibe of an Agonda beach resort, the front part of the resort is just on the beach, and it is still very easy to access from the back road, by bike or a car. 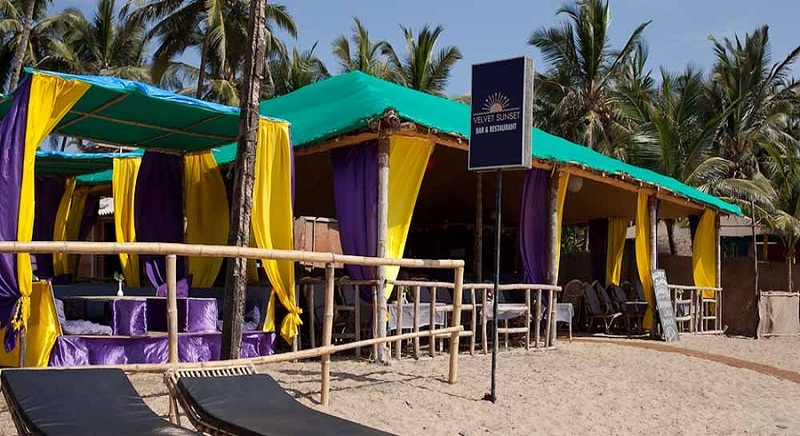 The front centre part of the common area is the Velvet Sunset restaurant, it couldn’t be more on the beach, set by the beach front huts, while the other cottages are set over and behind it. 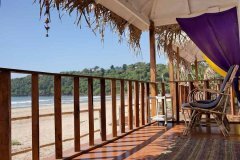 The restaurant is a real cosy spot to chill during the hot hours of the day, and a cool place to dine watching the sunsets every evening. 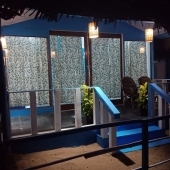 The resort is simple and modestly decorated, at the same time it is also very comfy and spoiling, shortly, if you search for special luxuries it might not be the place for you, But, if it’s a great location, nice people and good food you seek, consider it as a wonderful choice. 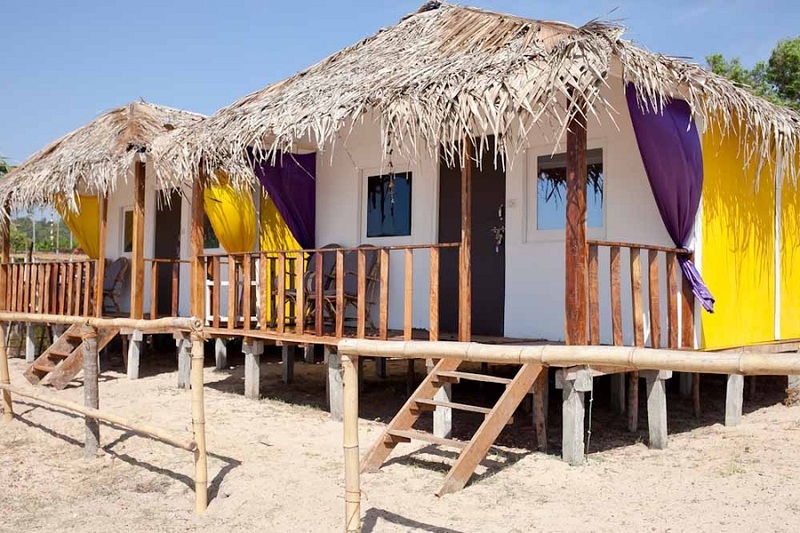 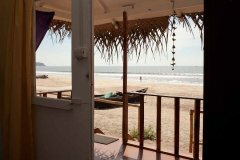 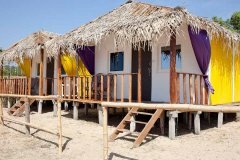 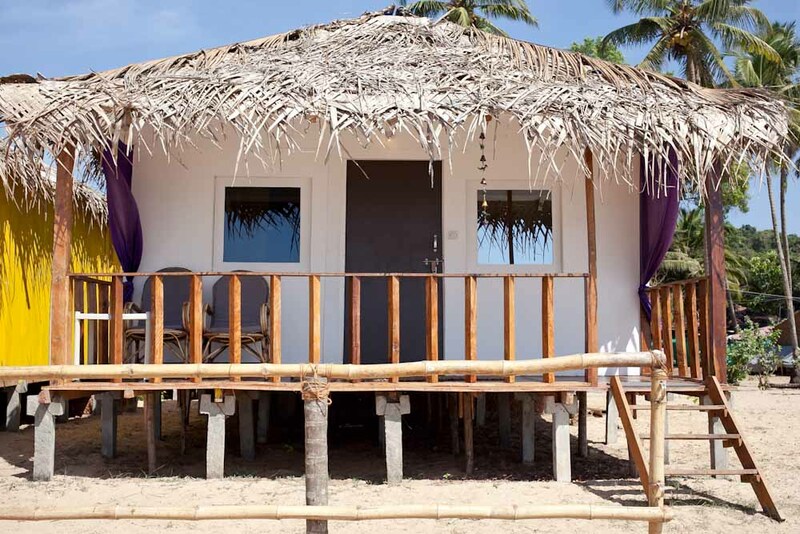 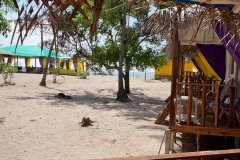 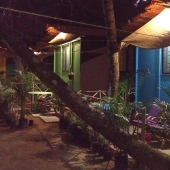 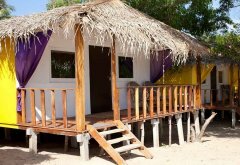 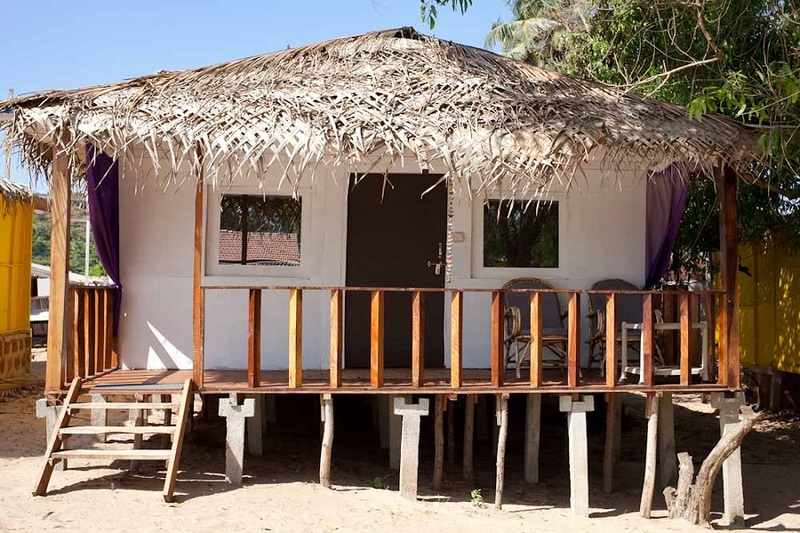 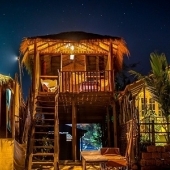 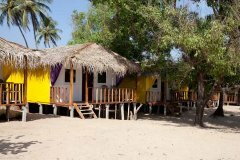 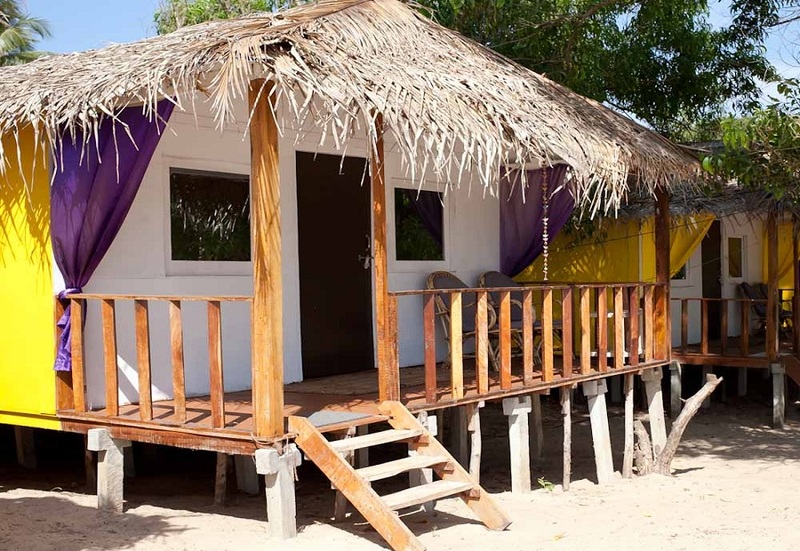 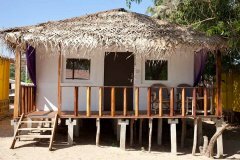 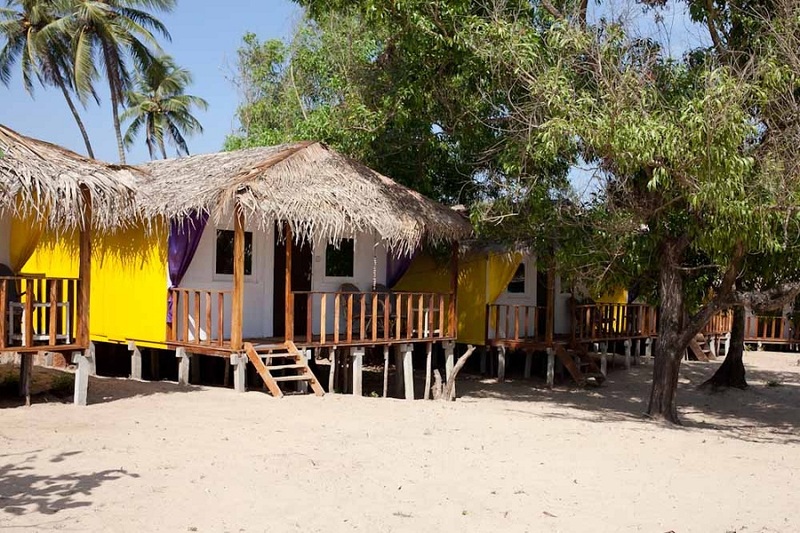 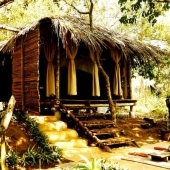 Beachfront huts in Velvet Sunset are specious wooden Goa huts with a full beach view of the front veranda, the huts are basically equipped and comfortable, furnished with a nice double bed, storage area, shower and toilet and a cool sitting area on the front porch, only 2 of this room type are available. 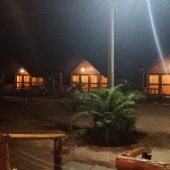 Sea View Huts are very similar to the Beachfront Huts, they do not have a full front sea view, but a partial one, as they are set in the compound behind the common area, they are similarly decorated as well, with a large double bed, storage, shower and toilet and a sitting area on the front porch, 4 of these huts are available. 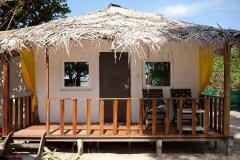 Family Hut is one of a kind in Velvet, it is a bigger version of the other huts, with a larger living area and an extra room, a large washroom, and beside the front veranda it has a second porch facing the river at the back of the resort, this Hut is built on the back of the common area of Velvet Sunset, making it even more quiet and fitting for a families with kids, the hut is furnished with double bed, bigger storage, and sitting areas. 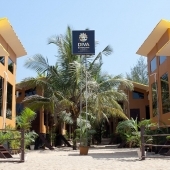 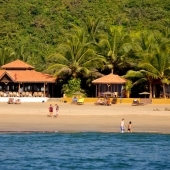 Velvet Sunset Agonda Resort is placed on the most north corner of Agonda beach in South Goa. 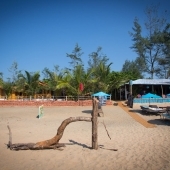 For taxi and bikes, the main beach road of Agonda reaches very close to the back side of the resort. 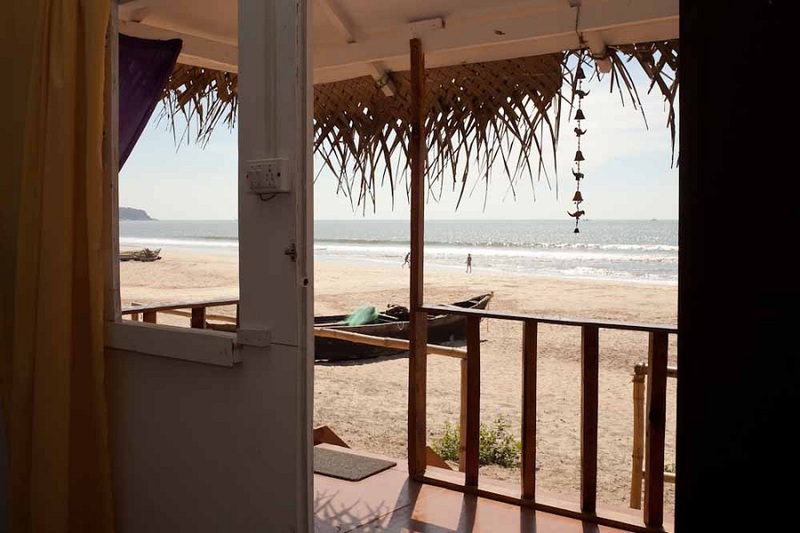 The near Bus Stand is in Agonda beach centre or at Canacona / Chaudi about 10 km from there. 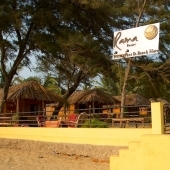 9 km from Canacona Train Station. 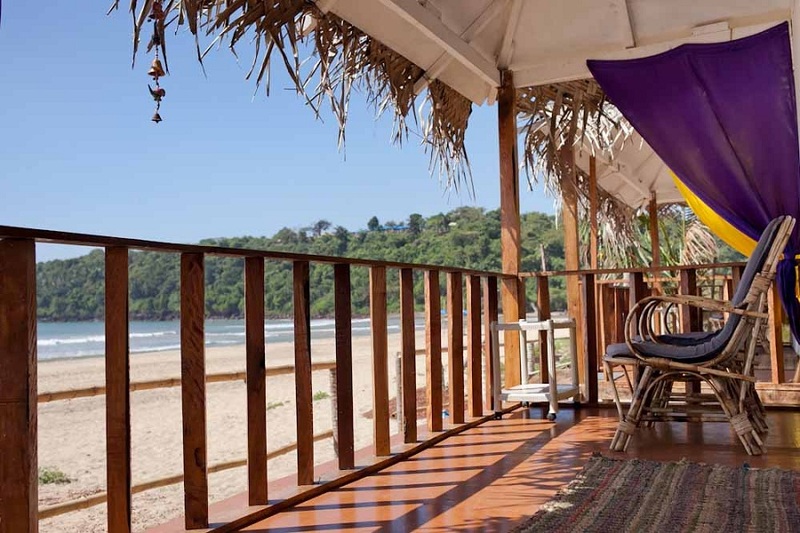 50 km of Dabolim International Airport. 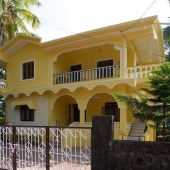 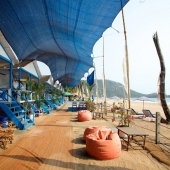 Agonda beach is close by to Palolem beach, Patnem beach, Rajbag Beach, Galgibaga Beach, Cola Beach all at a 10 km radius, the nearest resort to is Velvet Sunset is the Duck N Chill Agonda. 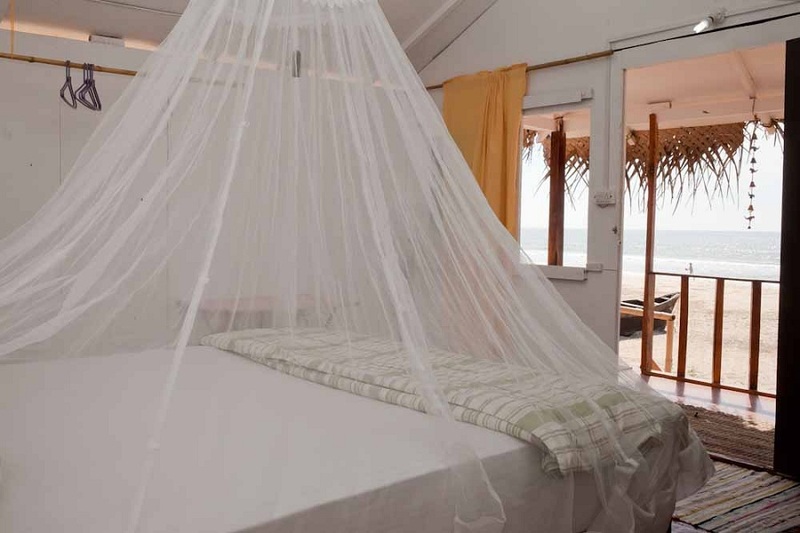 Velvet Sunset features 3 room types; Beachfront Hut – set by the restaurant on the beach, Sea View Hut – around the common area of the resort, and 1 really special Family Hut – built at the back of the resort facing the river of its back veranda. 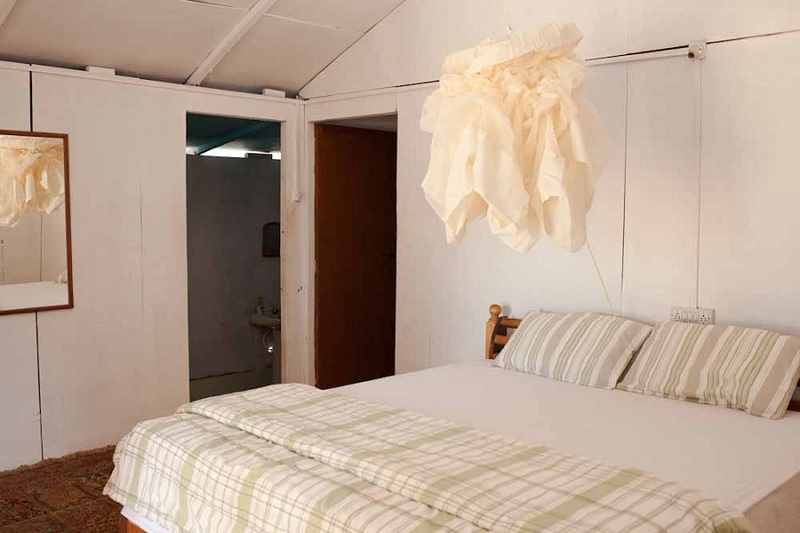 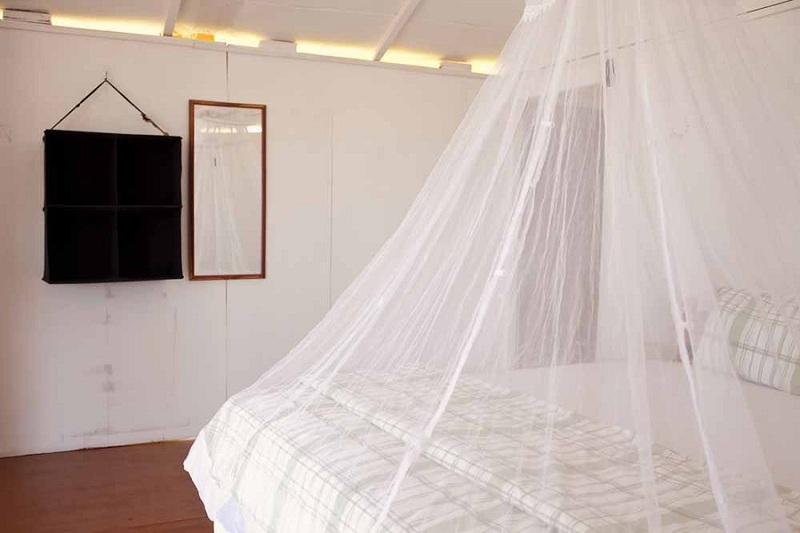 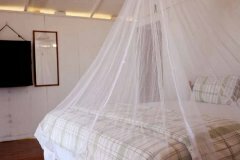 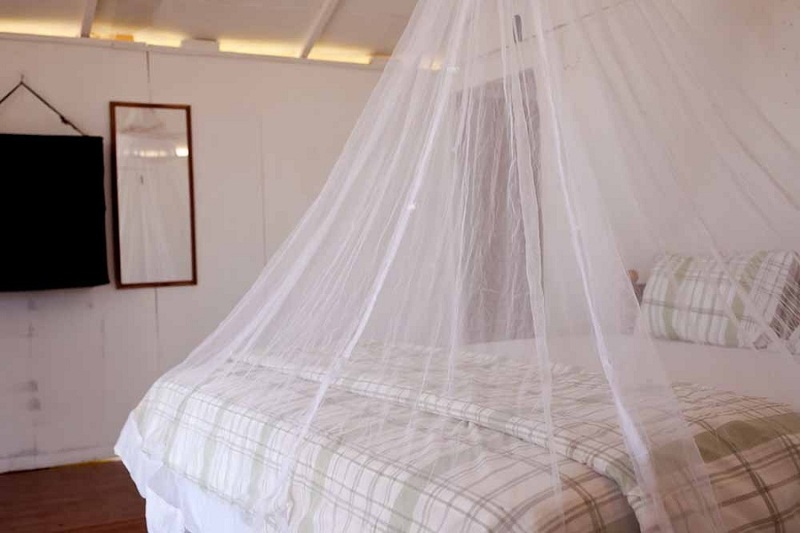 All the cottages are simply decorated, equipped a double bed, bathroom, ceiling fan, mosquito net and a balcony with a private sitting area. 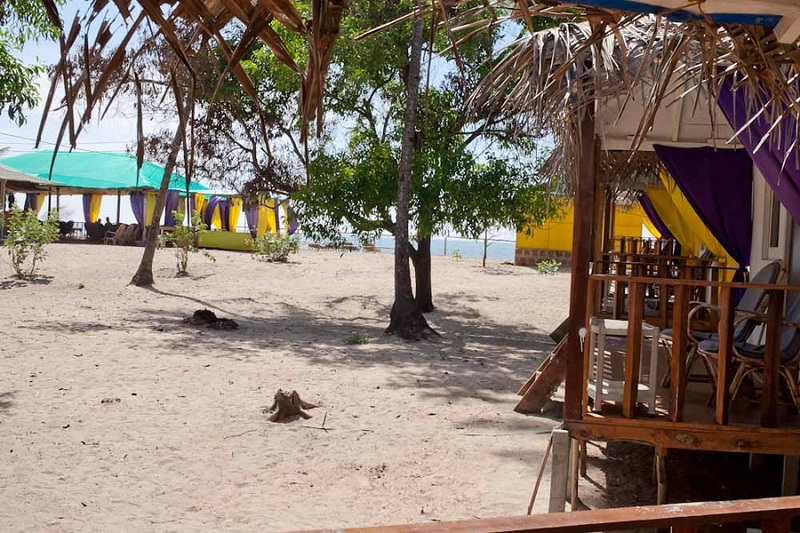 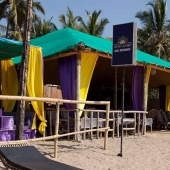 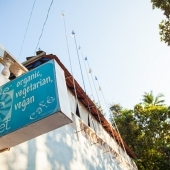 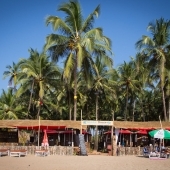 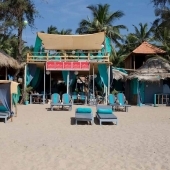 Velvet Restaurant is a typical Goa beach joint in the best way you can imagine, great Indian food, fresh beverages, good breakfast deals, relaxed atmosphere, music and very welcoming staff. 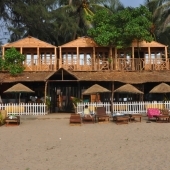 Minimum Booking 6 nights during Peak period from Dec 20 to Jan 10. 50% deposit (non-refundable) required during the Peak Holiday period from Dec 20 to Jan 5.